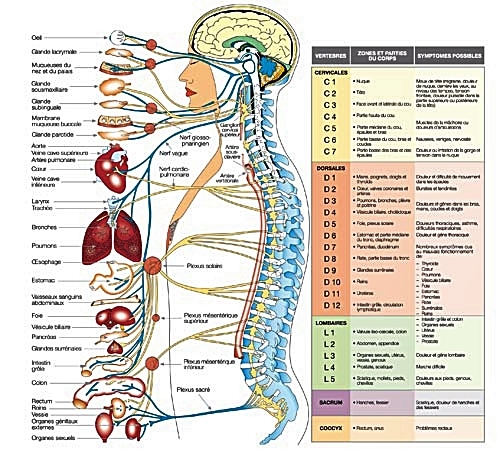 The central nervous system, which is protected by the spinal column and the cranium, consists of the following main organs - brain, spinal cord and nerves. The nervous system is the master controller of all cells, tissues and organs of the body. Nerves control the heart, lungs, immune system, endocrine system, as well as our thoughts and other cognitive processes. Effectively, the nervous system is in charge of directing and overlooking all bodily functions - keeping us alive and healthy, fighting off diseases and infections, and healing us after we have sustained injury. As the spinal cord descends from the brain, spinal nerve roots peel away from the spinal cord at each vertebral level and exit through openings made by adjacent vertebrae. These small protective pathways are called intervertebral foramen or IVFs and permit safe exit of the delicate nerve roots to the rest of the body. Because of the location of the IVF, herniated or bulging spinal discs, subluxated (misaligned) vertebrae, arthritic bony growths, and inflammatory biochemicals from nearby injured tissues commonly irritate or impinge upon the spinal nerve roots. As can be seen from the diagram, a subluxation - a misaligned vertebra - can affect various parts of the body. Chiropractors are the only doctors trained to detect and treat vertebral mis-alignments (subluxation) and fixations as well as many other common spinal abnormalities which cause nerve irritation and interference. Correcting nerve irritation and interference allows the body to function the way it was meant to.